Bacterial Spot: Leaf symptoms have been seen in only a few locations and only on highly susceptible varieties. Bacterial spot has not been troublesome this spring probably due to mostly dry conditions during petal fall and early covers. Fruit remains highly susceptible until pit hardening so management practices should be continued. San Jose Scale (SJS): Scale crawlers have not yet been seen but are usually active by now. The best materials include Esteem, Centaur, and Movento. Esteem and Centaur can both be applied at the start of crawler emergence. Movento may take up to a week become fully systemic. It should also be applied with a spreader. Spray volume is the name of the game when achieving good scale control. Diazinon can also be used with a maximum of 1 in-season application per year. The sprayer should be calibrated to soak all wood surfaces where there is known scale activity. Green Peach Aphids (GPA): GPA colonies are present in northern peach orchards at up to 3 colonies per tree and over 1 colony per tree in nectarines. For peaches these levels can be tolerated, but not on nectarines where GPA damage is present on the fruit. Plum Curculio (PC): PC activity is over in southern counties but still active in northern counties. Fresh eggs were recently deposited on peaches late last week. Activity should not last too much longer, so one additional cover of a PC effective insecticide should be all that is needed. Codling Moth (CM): The following chart updates application timings for southern and northern counties. Overall, trap counts are low, but a few sites still show populations above treatment levels. Some farms in northern counties trap average from 17 to over 80 moths per trap. This is considered very high pest pressure. Apple Scab: Given the previous extended period of dry weather, many primary scab spores had plenty of opportunity to mature, but were not released from their overwintering leaves. Now that the rains are here the remaining spores are being released. Therefor growers should remain covered, or use materials with sufficient back action for the individual wetting periods we are having. By next week growers that do not have scab can start to concentrate on the summer disease complex. Be sure to include materials effective for bitter rot. Aphids: Spirea and Apple (green) Aphids: Populations are starting to build. Our treatment threshold is set at 50% of the terminals infested with healthy colonies. Predation by lady beetles or other predators is always a good sign when present. In most cases biological control is possible if 20% or more of the infested terminals have beneficial insects actively feeding. When terminals begin to stop growth and harden, aphid populations will diminish, usually about early to mid July. Pear Rust Mite: Pear rust mites should be appearing soon. 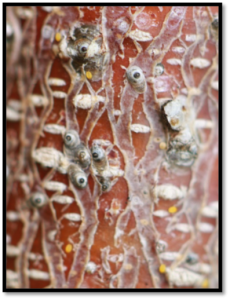 Whereas apple rust mite is desirable in apple orchards to provide a food source for predatory mites, the threshold for rust mites in pears is much lower. In the mid-Atlantic area you can generally tolerate up to 10 rust mites per fruit, which is a very low number since rust mites can easily be found in excess of 200-300 per leaf or fruit when the population starts to increase. Examine the calyx end of individual fruit with a strong hand lens. Russet damage appears starting from the calyx end and progresses up toward the stem. If this russet inhibits marketing of the non-russet varieties, rust mites should not be tolerated past the treatment threshold. However, higher populations may be tolerated on russet varieties like Bosc, especially if direct marketed. 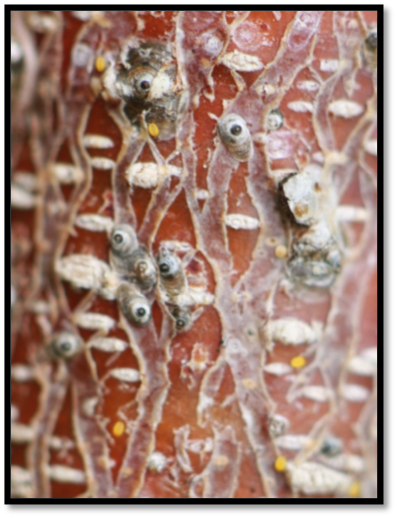 Pictures of rust mite on pear can be found here. Rust mites can be controlled with most miticides. Effective materials include Agri-Flex and Agri-Mek, Envidor, Nextar, Onager, and Savey (on early, low populations). Agri-Flex differs from Agri-Mek in that Agri-Mek has 8% abamectin, the active ingredient that controls mites, and Agri-Flex has 3% abamectin combined with 13.9% thiamethoxam (the a.i. in Actara). This means you need more Agri-Flex than Agri-Mek for mite control. The combination does not add anything for mite control, but does broaden the target spectrum to include aphids, psylla and PC. Remember that any abamectin formulation needs to be combined with oil or a silicon based penetrant. M-Pede applied @ 2 gals/100 will also do a good job controlling rust mite and will help to suppress any remaining psylla populations. M-Pede should not be applied in hot weather, since it can cause poor finish. Use caution if applying oil or M-Pede to oriental pears as some varieties may defoliate. 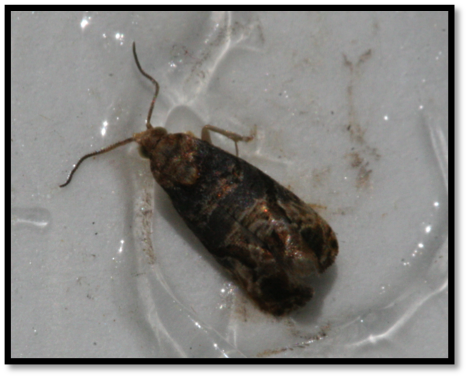 Grape Berry Moth (GBM): Trap captures of first generation adults have begun. Adults are laying eggs on newly forming clusters. These adults come from wild grapes in adjacent wood edges. Some species of wild grapes bloom earlier than vinifera varieties, which helps explain why the adults are present even before the cultivated grapes come into bloom. While growers can treat for the first generation just after bloom, the more critical timing is for the second generation. The phenology model used in Michigan, Pennsylvania and New York, uses wild grape bloom as the biofix and counts 810 degree days (base 47) until the timing for the first insecticide application. Last week wild grapes were just beginning to bloom, so we set the grape berry moth biofix at 5/26 in southern counties. We are using the Skybit models to accumulate degree days and will provide updates later in the season, but as a broad estimate, second generation treatments will likely be due at the beginning of July. Grape Berry Moth Adult in trap. Aphids: Aphids counts were up this week with 79.8% of sites having aphids present compared to last week with only 58.3%. The average percent of shoots with aphids was 10.0% per 50 shoot sample. The maximum percentage of shoots infested with aphids was 92% at a farm in Atlantic County. There is a low threshold for aphids since they are capable of vectoring Blueberry Scorch Virus. Growers with aphids present should target this pest and consider treatment options such as: Assail, Actara, Admire Pro and Sivanto. Sivanto is not a neonicotinoid, and is a bee safe product. It acts systemically against the aphids with a mode of action similar to the neonicotinoids. Cranberry Fruitworm (CBFW): This is the normal timing for CBFW treatments. Trap counts for CBFW remained low over the past week with only 2 CBFW adults found in traps. We are continuing to monitor traps for adults. When growers think of insecticides over this next week, aphids are first on the list, and CBFW should usually come in second. (Some Cherry Fruitworm larvae have also been seen.) Insecticide materials should be chosen that control both aphids and internal Leps. Leps. and other larva: Leps and leaf rollers were found in low numbers in the field over the past week. The maximum number of leaf rollers observed was 2 out of a 10 bush sample. Fruit damage from leps was observed at 66% of the sampled sites with an average of 0.45% of fruit damaged out of 1000 berries. Plum Curculio (PC): The number of sites with PC adults has decreased from 20%, to only 0.8% over the past week. In addition, the maximum number of PC adults found in the field also dropped to only 1 adult out of a 10 bush sample. We observed 40.3% sites with evidence of PC damage, and the average percentage of injured fruit at 0.35% per 1000 fruit sampled. The highest level of injury seen in a field was 4.3%. Damage is monitored by observing approximately 1000 fruit for crescent shaped scarring. Treatment options after bees are removed include: Avaunt, Imidan, Danitol, Brigade, Mustang Max (pyrethroids weaker on PC).